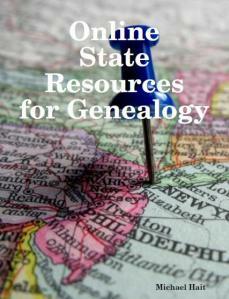 A second, much more expansive edition of Online State Resources for Genealogy is now available from its author, Michael Hait, CG. Michael is a friend and a colleague and he sent me a review copy free — but he didn’t have to: I bought his first edition and, like all other first edition subscribers, I was entitled to get the second edition free. And it’s that kind of user-centered thoughtfulness that makes this publication a good choice for all of us whose idea of a perfect day of researching is sitting at home, in front of our computers, preferably without ever having to change into day clothes. The first edition did a pretty decent job of cataloging those generally-unkown online resources — 310 pages with a lot of sources I hadn’t come across before, and it was well-received when it came out last year.2 The second edition is more than twice as long — 784 pages all together — with many more online resources and much more detail. There is simply an amazing array of resources out there and I can’t imagine anyone picking up a copy of this guide and not find useful resources you simply hadn’t heard of before. Want to browse through hundreds of thousands of Oklahoma newspaper pages dating from the 1840s to the 1920s? There’s a link to the Gateway to Oklahoma History at the Oklahoma Historical Society. Want to see the surveys filled out by returning WWI soldiers or their surviving kin in Virginia? There’s a link to the Library of Virginia’s World War I History Commission Questionnaires. How about a database of slaves and slaveholders from life insurance policies issued on slaves across the country? The link to the Slavery Era Insurance Registry at the California Department of Insurance will take you there. There’s so much more. Civil War diaries and letters from Iowa. Medal of Honor winners from Ohio. Oral histories from Illinois. Marriage contracts from St. Louis between 1764 and 1854. Truly amazing online archives from Cumberland County, Pennsylvania, ranging from militia accounts to school attendance lists. Digital maps and photos of Milwaukee neighborhoods. Perhaps the single best part of the book is the listing of university libraries with online archves. They’re simply among the best — and least known, least used — genealogical resources in the country. It obviously doesn’t include every online repository, but if you know of some you think should be in version 3, there’s an email address at the front for your suggestions. And an email address for any corrections as well. There are some little technical things that could make the book more useful. For example, hotlinks from the table of contents to specific entries or at least to the pages where they appear would be very helpful. Alternatively, having the PDF pagination match the page numbers in the table of contents would make it possible to go from the contents to a specific page more rapidly. On my Windows 7 64-bit operating system with Adobe Acrobat Pro 9, the PDF file opened initially as a PDF/A file, and that caused some problems with being able to click on a link in the file and go directly to the website. Switching out of PDF/A Mode (in Acrobat, under Edit | Preferences | Documents, choose Never under the PDF/A View Mode) took care of that. These minor technical issues aside, the book is a good solid guide to lesser known resources, and reasonably priced at $15.99. It’s available in two electronic flavors — as a PDF file and as an EPUB file for eReaders. and details on ordering can be found at Michael’s blog, Online State Resources for Genealogy e-book version 2.0 released!. Like those of us who bought the first edition, those who buy the second edition are entitled to one comprehensive free update.